The website has good interface and provides pleasant user experience. Betting with Sportsbet has been made easy as they provide multiple mediums online, through phone or mobile devices. The betting selection is excellent, in particular for Australian Sports. Banking for Aussie players has been made extremely easy but international players might face a hurdles as a highest level of ID proof is required by one that is passed, the process is smooth as silk. Their overall bonuses are good but might not be as appealing as a few other bookmakers. Sportsbet has years of experience, more than most other Aussie bookmakers meaning they have catered customers for years and know what it takes to satisfy them which is why their customer service is exquisite. 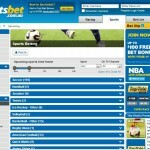 Sportsbet provides all the features necessary to cater Australians clients. Enter your name and email below and click submit. We will mail qualifying players the voucher code. Sportsbet is ranked one of the top bookies in Aussieland and its easy to see why. Find a comprehensive review on Sportsbet below. Sportsbet is an Australian bookmaker that commenced operations of offering sports and racing bets in 1993. It is located in Darwin, Melbourne and is licensed under the Northern Territory. 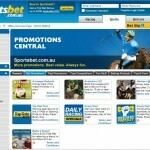 Sportsbet.com.au is a popular Australian betting company and was the first licensed bookmaker in Australia. 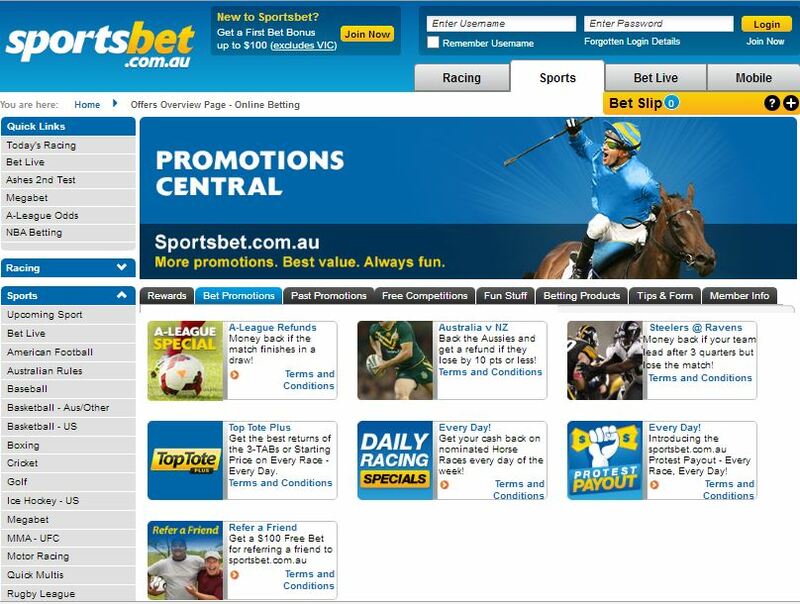 In May 2009, majority of Sportsbet shares was acquired by Irish bookmaking giant Paddy Power but Sportsbet still continues to run as a separate entity. Argentina, American Samoa, Aruba, Bahamas, Bahrain, Belarus, Bosnia, Bulgaria, Canada, Congo Republic, China, Cuba, Cyprus, Denmark, France, French Guiana, French Polynesia, French Southern Territories, Germany, Georgia, Greece, Iran, Iraq, Israel, Italy, Korea, Latvia, Lebanon, Liberia, Libya, Macau, Marshall Islands, Martinique, Mayotte, Mexico, Micronesia, Myanmar, Netherlands, Nigeria, Pakistan, Palestinian Territory, Puerto Rico, Republic of South Sudan, Rwanda, Spain, Sudan, Syria, Taiwan, Tanzania, Turkey, Turkmenistan, United States of America, United States Minor Outlying Islands, Uzbekistan, Wallis and Futuna, and Zimbabwe. Their website www.sportsbet.com.au features a functional interface and apart from the template used, is virtually identical to that used by IASbet (also under Paddy Power). The home page features 3 columns on the left each dedicated to top events, racing and Sports. On the top right they have tabs which are labeled clearly regarding their purpose. Upon placing the mouse cursor on each tab, it shows a menu regarding all the sporting events falling under specific category. This feature clearly benefits user navigation but upon clicking the category, the page is refreshed to display the sub markets on both navigation and center column. The sports navigation menu isn’t dynamic as pages are refreshed each time you view submarkets for different sports. The betting slip is excellent. As items are added the slip is displayed on top of other content in the right column, but can be hidden from view when you don’t wish to view it. As you move your cursor over the information icon for each selection, the bet details are displayed. Sportsbet is renowned as a superb Racebook covering major international tracks including the UK, Ireland, USA, South Africa, France, UAE, America, Singapore, Hong Kong and of course Australia. 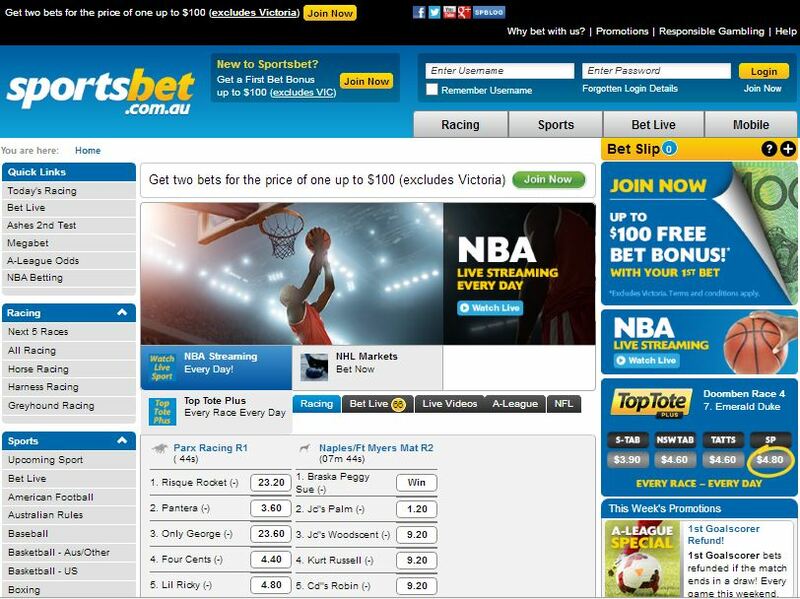 Apart from racing, Sportsbet also cover an array of sports betting options. Among these events and sports, the most highlighted events involve Horse Racing, Harness Racing, Greyhound Racing, Australian Rules, Baseball, Rugby League, Soccer and Tennis. City Best, Country Best, Fixed Odds, Top Fluc, SP, Quinellas and Trifects are available for throughout racing and harness and greyhound racing is paid at Home Tote. Fans of NRL, AFL and Super Rugby won’t be disappointed, with up to 40 markets for each fixture. International punters won’t be disappointed either, with a broad array of additional markets such as volleyball, handball, golf, cycling, and American sports. As is always the case with bookmakers, football (soccer) is well covered, with up to 100 soccer markets across over 100 leagues. 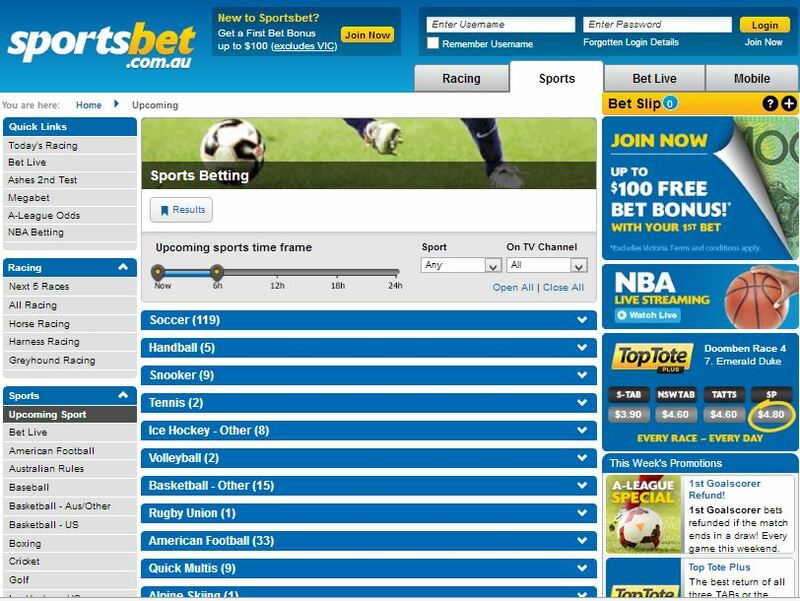 A downside well noticeable at Sportsbet is that Live betting is unavailable for Australians online. However, Live betting is available through phone betting. One of Sportsbet’s biggest strength would be mobile betting. You can place bets, deposit funs, view your recent bet history through their mobile website m.sportsbet.com.au or either apps available in iPhone, iPad and Android. Sportsbet does not lack in any form of betting which is why phone betting is another impressive feature that the bookmaker flaunts. Phone betting is available 24/7 but a small drawback would be the minimum requirement of a $50 stake. Another beautiful and practical feature at Sportsbet is the minimum bet that can be placed online. Unlike the $50 through phone betting, players can place a wager as low as $0.01 through their online website. The odds format presented Sportsbet are the standard EU odds or decimal odds. Australian bettors in general can withdraw funds from their Sportsbet account via the method they used to deposit. There are a couple of exceptions (like some issuers of MasterCard are a bit finicky about Gambling transactions). Non Australian based bettors (if they can be bothered with the certification of two types if ID to join) are best using reliable online payment processors like Moneybookers/Skrill or PayPal for quick and hassle-free withdrawals. 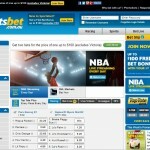 An area where Sportsbet stands out is their minimum deposit requirement. When many bookmakers do not even look at a figure below 2 digits, Sportsbet allow players to deposit as low as $5.00 if they wish. This clearly signals that the Aussie bookmaker isn’t only after high-roller but also look after newbies. With some of the best member promotions online, Sportsbet have stood the test of time as a quality bookmaker and they continually strive to provide value for their members with some very innovative betting products. Sportsbet offer top odds on sport and racing events plus they have a number of quality member promotions available each week that are designed to give punters value for money. 100% match up to $100 instant free bet with the first bet. Various terms and conditions apply to all their promotions, nonetheless it does not stop the appeal that these promotions carry. Once a deposit is made, players need to turnover the total amount at least once before being able to make a withdrawal. All bonus credits require a turnover of 1x at 1.5 odds or greater for Australian residents, 5x at 1.50 odds or greater for non-Australian residents. Their customer support team can be reached 24/7 through live chat, phone or email. Their instant live chat system seems really professional and is willing to assist clients whenever necessary.